A woman whose son was beaten to death by IRA members has called on Mary Lou McDonald to speak out about a private Sinn Fein chat group in which her family were branded “wasters with a sob story”. She was speaking after the content of a Whatsapp message group – reportedly formed with the phone of Dessie Ellis, Sinn Fein TD for North Dublin – was made public by the Irish Sun. Mr Ellis served 10 years in the south for IRA explosives charges. In the group, a party member called ‘Ciaran Doc’ said a possible general election would result in the media being “on the phone to Cahill, Stack, Quinn et al and every other waster they can wheel out with a sob story”. It is understood he was referring to Máiría Cahill, who says she was raped by a IRA man, and the families of Irish prison officer Brian Stack and south Armagh truck driver Paul Quinn, who were both murdered by the IRA. Briege Quinn, mother of Paul, said she was hurt by the remarks. “That is disgusting, isn’t it?” she said. “That is the second time that Sinn Fein has hurt and insulted us. The first time was when Conor Murphy [MLA] called Paul a criminal, even though he had no criminal convictions. And now for this fellow to say we are telling sob stories – where is Mary Lou McDonald in all this? 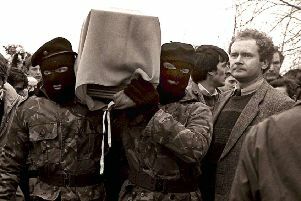 Sinn Fein’s line, she said, is that it supports her and hopes she gets justice “but now they come out and hurt us again”. In 2007 her son Paul, 21, was lured to a Co Monaghan shed after he reportedly fought with the son of a senior IRA figure. Sinn Fein said on Monday the commments were “completely unacceptable” and that it is “currently trying to establish the facts of this matter”. Now Mr Ellis has told the News Letter that the WhatsApp group was set up two years ago for Dublin North West using his phone but that he was not a member and did not participate in it. “I made no comments and completely disagree with the comments that were made and disassociate myself from them,” he said.